HOUSTON – A day after surgery to repair her skull, Arizona Rep. Gabrielle Giffords’ doctor has dubbed her “gorgeous Gabby,” encouraged by how she looks and is communicating after an operation considered a major milestone in her recovery from a gunshot wound. Giffords had some pain and nausea shortly after the surgery, but a scan of her brain showed the operation was successful, said Dr. Dong Kim, the neurosurgeon who performed the intricate, three-and-a-half-hour procedure. She’s doing so well that doctors are beginning bedside rehabilitation therapy, and say she’s on the path to being released, although they won’t discuss a timetable. Doctors had to remove a piece of the congresswoman’s skull to allow for her brain to swell after she was shot in the head four months ago at a political meet-and-greet in Tucson, Ariz. Six people were killed in the attack and thirteen others injured, including Giffords. To replace the missing bone, Kim attached a piece of molded hard plastic with tiny screws. Giffords’ astronaut husband, Mark Kelly, who is orbiting Earth on the space shuttle Endeavour, said he kept in touch with his mother-in-law, his identical twin brother Scott, and his wife’s chief of staff throughout the surgery, and that he is pleased with how it went. Giffords also had a permanent shunt placed in the skin behind her ear to drain spinal fluid from her brain and into her abdomen, Kim said. It will relieve pressure from fluids that often build up in patients with a brain injury, but it’s not visible and many patients forget they have one, doctors said. The surgery carries a 5 to 10 percent risk of infection, Kim said. There are still some remaining bullet fragments in Giffords’ brain that will not be removed because doing so could make her condition worse, he said. Once Giffords returns to TIRR Memorial Hermann in Houston from the nearby Memorial Hermann-Texas Medical Center where she underwent the surgery, the shunt and the skull surgery will further help her recovery. “We’re optimistic that when she comes back we’ll see a lot of changes that will allow us to upgrade the rehabilitation,” said Dr. Gerard Francisco, the head of Giffords’ rehabilitation team. CAPE CANAVERAL, Fla. – Endeavour blasted off on NASA’s next-to-last shuttle flight, thundering through clouds into orbit Monday morning as the mission commander’s wounded wife, Gabrielle Giffords, watched along with an exhilarated crowd estimated in the hundreds of thousands. 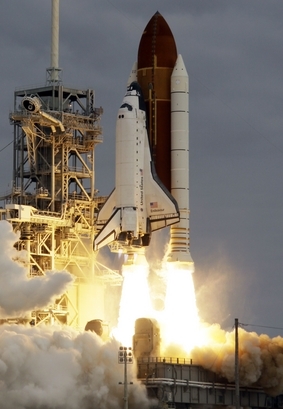 NASA is winding down its 30-year-old shuttle program before embarking on something new. The event generated the kind of excitement seldom seen on Florida’s Space Coast on such a grand scale — despite a delay of more than two weeks from the original launch date because of an electrical problem. The shuttle quickly disappeared into the clouds. “That was four seconds of cool,” said Manny Kariotakis, who was visiting from Montreal. The 50-year-old got goosebumps watching the liftoff with thousands along Highway 1 in Titusville. Remarkably, Giffords made a return visit to see Kelly off. She is still undergoing rehabilitation in a Houston hospital to recover from a gunshot wound to the head in an assassination attempt little more than four months ago. The Arizona congresswoman was shielded from the cameras on launch day, as were the families of the other five astronauts. All watched the liftoff in private. Giffords has kept out of the public eye since the Jan. 8 shooting that wounded her and killed six in Tucson, Ariz.
She and Kelly said their goodbyes, face to face on Sunday. With Kelly at the helm, Endeavour and its experienced crew of five Americans and an Italian are headed for the International Space Station. They will arrive at the orbiting outpost Wednesday, delivering a $2 billion magnetic instrument that will seek out antimatter and dark energy in the universe. Up to 45,000 guests jammed into NASA’s launch site, and thousands packed area roads and towns to see Endeavour soar one last time. Only one shuttle flight remains. VIPs included Apollo 11’s Michael Collins and four other members of Congress. 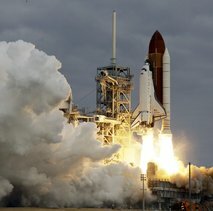 Advance estimates had put Monday’s crowd at 500,000, more than the number that saw Discovery’s final hurrah in February. Across the Indian River in Titusville, though, the number of spectators appeared to be down compared with Endeavour’s previous launch attempt on a Friday afternoon. Titusville Assistant Police Chief John Lau guessed the crowd at between 350,000 and 400,000. “I don’t know if it was the early morning or what,” Lau said. Electrical trouble grounded the shuttle on April 29, disappointing the hordes of visitors, including President Barack Obama and his family. Repairs over the past two weeks took care of the problem. “God Speed Endeavour We’re ready for you!” space station resident Ronald Garan Jr. said in a Twitter update. At launch, the space station was 220 miles high, just southeast of Halifax, Nova Scotia. Kelly almost didn’t make the flight. The 47-year-old Navy captain took a leave from training to be by his wife’s side after she was wounded, and it seemed unlikely he would stay with the flight. But Giffords improved and was moved from the hospital in her hometown of Tucson to Houston where Kelly lives and does astronaut training. Her days were filled with rehab work, and he yearned to see the shuttle mission through. A month after the shooting, he announced he would fly. He rejoined his crew in February, still managing to see his wife across town every morning and evening. Giffords’ visit to Kennedy Space Center — the third time she’s seen her husband soar into space — ratcheted up the excitement level for what already was a big event, said launch officials. Kelly’s identical twin, Scott, who’s also an astronaut, witnessed the launch with his two teenage nieces, Mark’s daughters from a previous marriage. This is the 25th and final flight of Endeavour, the baby of NASA’s shuttle fleet. It was built to replace Challenger, destroyed during liftoff 25 years ago this past January, and made its maiden journey six years later to capture and repair a stranded satellite. That first flight ended 19 years ago Monday. Endeavour carried the first Hubble Space Telescope repair team, which famously restored the observatory’s vision in 1993, and the first American piece of the space station in 1998. It will end its days at the California Science Center in Los Angeles. As of Monday, Endeavour had logged more than 116 million miles, circled Earth some 4,500 times, spent 283 days in space and carried 170 people, including the last two people to fly a space shuttle for the first time. American Mike Fincke and Italian Roberto Vittori are making their first flight on a shuttle although they’ve been to the space station twice, ferried their by Russian Soyuz rockets. Fincke will team up with Andrew Feustel and Gregory Chamitoff for four spacewalks during the 16-day mission. It will be the last spacewalks conducted by a shuttle crew. NASA’s last shuttle flight, by Atlantis, is targeted for July. After that, Atlantis will remain at Kennedy, where it will go on display at the visitor complex. Discovery will head to the Smithsonian Institution’s hangar outside Washington. American astronauts, meanwhile, will continue to hitch rides to the space station on Russian Soyuz rockets. Private companies hope to pick up the slack, but that’s still years away. Once Atlantis flies, it will be three years — at best — before Americans are launched again from U.S. soil. Some NASA observers fear it could be a full decade. The White House wants NASA focusing on eventual expeditions to asteroids and Mars, unfeasible as long as the shuttles are flying given budget constraints. Ohioan Stan Oliver made a last-minute trip for the launch. The assisted-living residence manager got a ticket to Tampa and then drove Sunday night to Titusville, where he slept in his car. AP writers Seth Borenstein and Mike Schneider in Titusville, Fla., contributed to this report. PHOENIX – Arizona Rep. Gabrielle Giffords spoke for the first time since she was shot in the forehead, her spokesman said Wednesday, yet another significant milestone in her recovery from a traumatic brain injury. Giffords first spoke within the past few days and is speaking “more and more,” spokesman C.J. Karamargin said Wednesday. He didn’t know what her first words were, but said at breakfast one morning she asked for toast. He said “there are encouraging signs every day,” pointing to her renewed appetite. “Your prayers are being heard, so don’t stop,” he wrote. Kelly, a NASA astronaut, said last week that he expects his wife to be well enough to be at his space launch in two months. The space shuttle Endeavour will leave April 19 for a two-week mission to the International Space Station, and Kelly will be on board leading a veteran, all-male crew. The mission will be Endeavour’s final flight and Kelly’s fourth. Dr. Gerard Francisco, who is treating Giffords at a rehabilitation facility in Houston, said Tuesday that he hopes the congresswoman can make enough progress to attend the space launch, but said it’s too early to say.